The anticipated day is here! The day after Thanksgiving the day known as BLACK FRIDAY. On this day most of your favorite stores host big sales and reduce prices. Making it one of the best times of the year to buy gifts for others and cute pieces for yourself at more affordable prices then usual. Every year, if I'm in the same state as my sisters we go Black Friday shopping. We love the thrill that you get when shopping mid-night madness, Black Friday, but you have to have a plan. Plan what stores you want to go, research their hours and location so you can fully take advantage of this fabulous shopping day. Forever21: Pre-Black Friday sale began, featuring up to 50% select items and $10 off boots. On The actual day of, Forever 21 will have their yellow tag deals starting items as low as $ 3.00. Target: While quantitates last Target will host their doorbuster sales which feature select boots, starting at $18, BUY 1 GET 1 FREE gloves, select faux-leather jackets for $20, a great winter piece. Also if you spend $75 or MORE you will get 20 % OFF ONE SHOPPING TRIP between December 1-7. Macy's: Most stores will open at 8 p.m. Thanksgiving Day featuring doorbusters and a.m. specials. In lieu of Black Friday for this outfit I’m wearing the timeless color black, printed pants and gold accessories to top it off. Hopefully this snap shot of some of the sales going on will be of help to get you out there and save! P.S. Remember Small Business Saturday is after Black Friday and Cyber Monday follows. Take advantage of the sales. HAPPY SHOPPING! Chambray shirt: One of my favorite pieces of all time. Not to be confused with the denim shirt, it is a much lighter weight woven fabric usually made from cotton. According to the Ralph Lauren style guide,"chambray became the fabric staple for the American workingman's shirt in the early 20th century," and still today it is a must have piece. 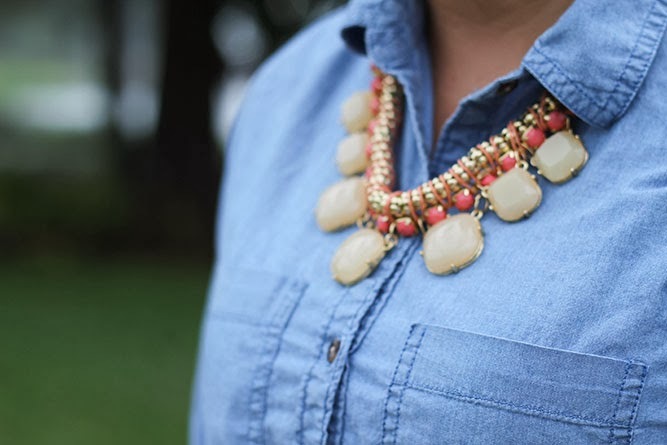 The chambray shirt is just so versatile. 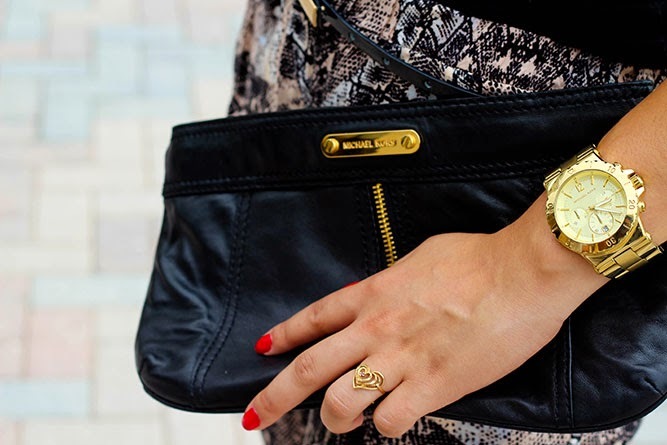 It is the perfect item that will allow you to mix and match your favorite pieces to expand your wardrobe. You can wear it for any season and almost any occasion. If you are headed to the pool or the beach on a nice summer day you can wear it as a cover up. 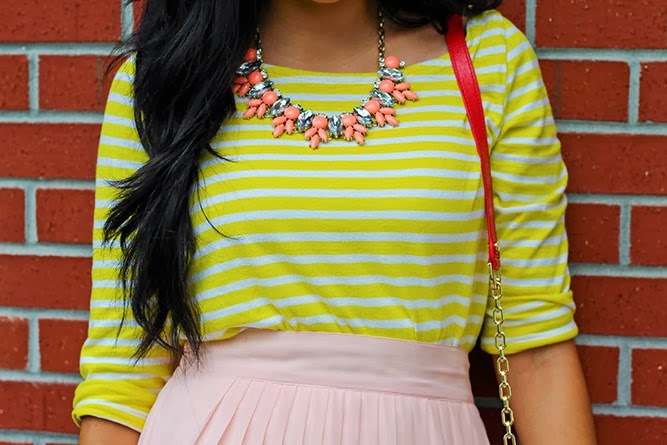 You can also wear it to dress down that cute dress that you can't just wear for any occasion. It doesn’t end there, the chambray shirt can also serve as a perfect layering piece. Wear it under your favorite sweater or cardigan, use it as a cardigan on top of a cute pattern tank or V-neck shirt, tie it over your favorite maxi dress and so much more. Another great styling use for the chambray shirt is pairing it with your favorite color and or pattern bottoms. For this outfit I explored with mixing textures and of course one of them is the chambray shirt. I paired it with the contrasting timeless texture of lace. Now for the best aspect of the chambray shirt it gets better with time. Really if there will ever be a piece that ages well in your wardrobe, it will be the chambray shirt. When it starts to get the vintage look the better it is, I feel. Generally an investment on a chambray shirt will be a great one and lasting one. Think about it is an essential, low-maintance, durable, comfy, stylish and classic piece. Plus you can create a cute look effortlessly. The iconic chambray shirt will forever be an unceasing must have piece. P.S. If you are interested on investing on a chambray shirt GAP online & in stores is hosting the friends event. Use the promo code GAPFRIENDS unitl 11/11 and get 30% OFF YOUR PURCHASE!